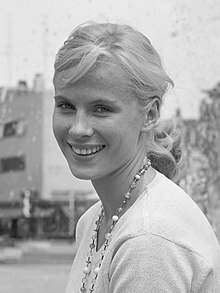 Berit Elisabeth Andersson (11 November 1935 – 14 April 2019),  known professionally as Bibi Andersson (Swedish: [²bɪbːɪ ²anːdɛˌʂɔn] ), was a Swedish actress who was best known for her frequent collaborations with filmmaker Ingmar Bergman. Ernst Ingmar Bergman was a Swedish director, writer, and producer who worked in film, television, theatre and radio. Considered to be among the most accomplished and influential filmmakers of all time, Bergman's films include Smiles of a Summer Night (1955), The Seventh Seal (1957), Wild Strawberries (1957), Persona (1966), Cries and Whispers (1972), Scenes from a Marriage (1973), and Fanny and Alexander (1982); the last two exist in extended television versions. Kungsholmen is an island in Lake Mälaren in Sweden, part of central Stockholm. It is situated north of Riddarfjärden and considered part of the historical province Uppland. Its area is 3.9 km2 (1.5 sq mi) with a perimeter of 8.9 km (5.5 mi). The highest point is at Stadshagsplan at 47 metres (154 ft). The total population is 56,754. Social work is an academic discipline and profession that concerns itself with individuals, families, groups and communities in an effort to enhance social functioning and overall well-being. Social functioning refers to the way in which people perform their social roles, and the structural institutions that are provided to sustain them. Social work applies social sciences, such as sociology, psychology, political science, public health, community development, law, and economics, to engage with client systems, conduct assessments, and develop interventions to solve social and personal problems; and create social change. Social work practice is often divided into micro-work, which involves working directly with individuals or small groups; and macro-work, which involves working with communities, and within social policy, to create change on a larger scale. A detergent is a surfactant or a mixture of surfactants with cleaning properties in dilute solutions. These substances are usually alkylbenzenesulfonates, a family of compounds that are similar to soap but are more soluble in hard water, because the polar sulfonate is less likely than the polar carboxylate to bind to calcium and other ions found in hard water. The Royal Dramatic Theatre is Sweden's national stage for "spoken drama", founded in 1788. Around one thousand shows are put on annually on the theatre's eight running stages. Ingrid Lilian Thulin was a Swedish film actress. Eva Elisabet Dahlbeck was a Swedish stage, film, and television actress. She received a Cannes Film Festival Award for Best Actress for her performance in the film Brink of Life (1958). Dahlbeck retired from acting in 1970 and became an author. The Cannes Best Actress Award is an award presented at the Cannes Film Festival. It is chosen by the jury from the official films in competition at the festival. It was first awarded in 1946. The ceremony was cancelled in 1948, 1950, and 1968. No awards were given to actresses in 1947. On four occasions, the jury has awarded multiple women the prize from one film. The four films were A World Apart, Brink of Life, A Big Family, and Volver. The jury also on occasion cites actresses with a special citation that is separate from the main award. The award can be for lead or supporting roles with the exception of the period from 1979 to 1981, when the festival used to award a separate "Best Supporting Actress" prize. The Silver Bear for Best Actress is the Berlin International Film Festival's award for achievement in performance by an actress. It is selected by the jury of the festival for films in the official competition slate. 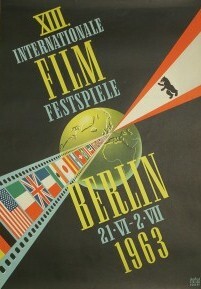 The 13th annual Berlin International Film Festival was held from 21 June to 2 July 1963. The Golden Bear was awarded to the Italian film Il diavolo directed by Gian Luigi Polidoro and Japanese film Bushidô zankoku monogatari directed by Tadashi Imai. David Harald Vilgot Sjöman was a Swedish writer and film director. His films deal with controversial issues of social class, morality, and sexual taboos, combining the emotionally tortured characters of Ingmar Bergman with the avant garde style of the French New Wave. He is best known as the director of the films 491 (1964), I Am Curious (Yellow) (1967), and I Am Curious (Blue) (1968), which stretched the boundaries of acceptability of what could then be shown on film, deliberately treating their subjects in a provocative and explicit manner. Liv Johanne Ullmann is a Norwegian actress and film director. She was one of the "muses" of Swedish director Ingmar Bergman. The Guldbagge for Best Actress in a Leading Role is a Swedish film award presented annually by the Swedish Film Institute (SFI) as part of the Guldbagge Awards to actresses working in the Swedish motion picture industry. The 4th Guldbagge Awards ceremony, presented by the Swedish Film Institute, honored the best Swedish films of 1966 and 1967, and took place on 9 October 1967. Persona, directed by Ingmar Bergman, was presented with the award for Best Film. Mai Elisabeth Zetterling was a Swedish actress and film director. Persona is a 1966 Swedish psychological drama film, written and directed by Ingmar Bergman and starring Bibi Andersson and Liv Ullmann. The story revolves around a young nurse named Alma (Andersson) and her patient, well-known stage actress Elisabet Vogler (Ullmann), who has suddenly stopped speaking. They move to a cottage, where Alma cares for Elisabet, confides in her and begins having trouble distinguishing herself from her patient. 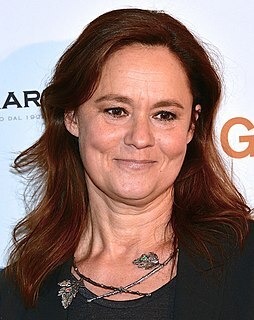 Pernilla August is a Swedish actress, director and screenwriter. Being one of Sweden's leading actresses and a longtime collaborator with director Ingmar Bergman, she won the Best Actress Award at the 1992 Cannes Film Festival for her role in his The Best Intentions. She is best known for portraying Shmi Skywalker in Star Wars: Episode I – The Phantom Menace and Star Wars: Episode II – Attack of the Clones. Hour of the Wolf is a 1968 Swedish psychological horror film directed by Ingmar Bergman and starring Max von Sydow and Liv Ullmann. The story explores the disappearance of fictional painter Johan Borg, who lived on an island with his wife Alma (Ullmann) while plagued with frightening visions and insomnia. The Touch is a 1971 romantic drama film directed by Ingmar Bergman and starring Max von Sydow, Bibi Andersson, Elliott Gould, and Sheila Reid. The film tells the story of an affair between a married woman and an impetuous foreigner. It contains references to the Virgin Mary and the Holocaust. Maria Helena "Mimi" Pollak was a Swedish actress and theatre director. Harriet Andersson is a Swedish actress, best known outside Sweden for being part of director Ingmar Bergman's stock company. She often plays impulsive, working class characters. Jan Wilhelm Malmsjö is a Swedish stage and film actor, musical star and singer. He is married to Marie Göranzon and father to Jonas Malmsjö. Gunn Wållgren, was a Swedish actress. Ewa Fröling, Eva Marie Fröling , is a Swedish actress and director who was born in Stockholm. She is internationally most recognized for her leading parts in Gunnel Lindblom's Sally och friheten and Ingmar Bergman's Fanny and Alexander. Anita Björk was a Swedish actress. Maj-Britt Nilsson was a Swedish movie actress of the 1940s and 1950s. Birgitta Valberg was a Swedish actress. She was best known for her work in several Ingmar Bergman films made over a 30-year period, including the Bergman produced Paradise Place (1977). For her role in this film, which was directed by Gunnel Lindblom, another member of Bergman's repertory company, she won the award for Best Actress at the 13th Guldbagge Awards. Gertrud Fridh was a Swedish stage and film actress. Gunnel Märtha Ingegärd Lindblom is a Swedish film actress and director. As an actress she has been particularly associated with the work of Ingmar Bergman, though in 1965 she performed the lead role in Miss Julie for BBC Television. She also played the key-role of The Mummy in Bergman's staging of Strindberg's The Ghost Sonata in 1998-2000, a performance that earned her much critical acclaim. 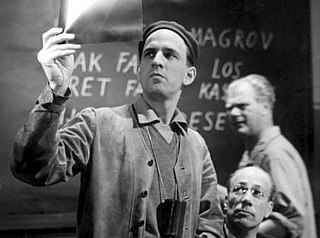 Ingmar Bergman was a Swedish screenwriter and film director. Between 1944 and 2003 he directed 45 feature films and wrote many screenplays for others. He was also a playwright and theatre director, and he simultaneously worked extensively in theatre throughout his film career. ↑ Thomson, David (2014). The New Biographical Dictionary of Film: Sixth Edition. Knopf Doubleday Publishing Group. p. 68. ISBN 9781101874707. 1 2 3 4 Gates, Anita (14 April 2019). "Bibi Andersson, Luminous Presence in Bergman Films, Dies at 83". The New York Times. Retrieved 14 April 2019– via NYTimes.com. 1 2 Segrave, Kerry; Martin, Linda (1990). The Continental Actress: European Film Stars of the Postwar Era. McFarland. p. 274. ISBN 0-89950-510-4. 1 2 Wilson, H.W. Current biography yearbook. H.W. Wilson Company. p. 13. ISBN 0-8242-0997-4. 1 2 "Eight key actors in the Ingmar Bergman universe". British Film Institute. Retrieved 14 April 2019. ↑ Macnab, Geoffrey (6 January 2003). "Now wash your hands". The Guardian. Retrieved 14 April 2019. ↑ "Bibi Andersson, 'Persona,' 'The Seventh Seal' Actress, Dies at 83". Variety. Retrieved 15 April 2019. 1 2 Bergan, Ronald (15 April 2019). "Bibi Andersson obituary". The Guardian. Retrieved 15 April 2019. ↑ "Berlinale: Prizes & Honours 1963". Berlinale.de. Internationale Filmfestspiele Berlin. Retrieved 13 February 2010. ↑ "The Kremlin Letter (1970)". Shock Cinema Magazine. Retrieved 14 April 2019. ↑ "Film: Altman Offers Apocalyptic Fantasy:End Game". The New York Times. Retrieved 14 April 2019. ↑ "MCQUEEN IN 1976 'ENEMY OF THE PEOPLE'". The New York Times. Retrieved 15 April 2019. ↑ Barnes, Clive (8 November 1973). "The Stage: Remarque's 'Full Circle'". The New York Times. Retrieved 14 April 2019. ↑ Ebert, Roger. "I Never Promised You a Rose Garden". RogerEbert.com . Retrieved 14 April 2019. ↑ "Arkivet Rollboken – Dramaten". www.dramaten.se. Retrieved 14 April 2019. ↑ "Bibi Andersson". Ingmar Bergman. Retrieved 14 April 2019. ↑ "Ett ögonblick från 1996". tradera. Retrieved 14 April 2019. ↑ "Bibi Andersson Biography". Film Reference. Retrieved 14 April 2019. ↑ "Bibi Andersson gift i hemlighet". aftonbladet. Retrieved 14 April 2019. ↑ "Acclaimed actress Bibi Andersson has died, aged 83". Far Out Magazine. Retrieved 14 April 2019. ↑ "Bibi Andersson dies at 83". The Washington Times. Retrieved 14 April 2019. ↑ "Bibi Andersson". Svensk Filmdatabas. Retrieved 14 April 2019. ↑ "Sweden's Bibi Andersson holds out her Ibsen Centennial Award". Getty Images. Retrieved 14 April 2019. ↑ Schmadel, Lutz D. (2015). Dictionary of Minor Planet Names: Addendum to 6th Edition: 2012-2014. Springer. p. 192. ISBN 9783319176772. Wikimedia Commons has media related to Bibi Andersson .